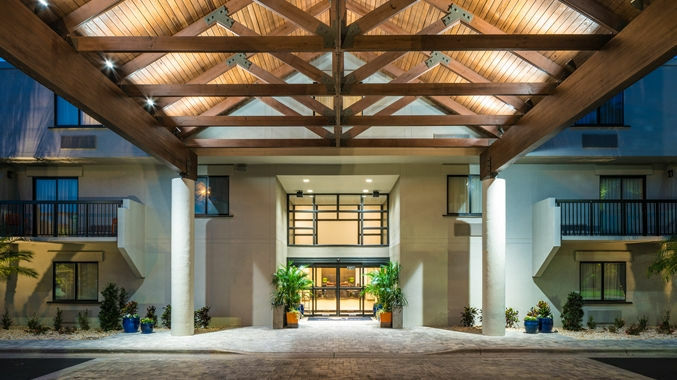 The DoubleTree by Hilton Gainesville delivers an experience unlike any other. When you enter the hotel you are greeted by an amazing staff entering our glass sided atrium with our indoor outdoor bar.The DoubleTree boasts 205 beautiful, spacious rooms, renovated Summer 2016. All of our rooms come with 50” HDTVs and Sweet Dream DoubleTree bedding Package, our bathrooms come fully stocked and in case you forget anything, just stop by the front desk, we offer complimentary personal toiletry and travel necessities. To make you feel a little more at home we have an outdoor pool (so you can soak up some Florida sunshine), a lending library, and state of the art fitness center.Let us start your day off right with a Wake Up DoubleTree breakfast buffet with cook to order items available. Then enjoy our wonderful ultra modern indoor outdoor bar in our beautiful atrium style lobby and outdoor courtyards.For the business traveler the Doubletree offers complimentary copying and faxing, as well as complimentary WiFi, so you can keep up with important work. With extra focus on business needs, we have three meeting rooms to accommodate small and large business meetings, our sales staff will make sure your meetings go as smooth as possible.Whether you're here for work, vacation, or just visiting the kids, we have tried to anticipate all of your travel needs, however if something special does arise feel free to ask our knowledgeable and friendly staff. We're here to make your stay as comfortable as possible.From our beautiful rooms, to our amazing breakfast, the DoubleTree by Hilton Gainesville provides the very best. Located only 3 miles from the University of Florida, UF Health/Shands Hospital and the V.A. Hospital. The DoubleTree is within walking distance of many shops and restaurants, including several that offer discounts specifically for our guests.